9606: no drain, Dimensions: 40" x 40" x 12" (1,016 mm x 1,016 mm x 305 mm),Weight: 51 lbs. (23 kg),Containment Capacity: 62 gallons (235 L),Uniformly Distributed Load: 800 lbs. (363 kg). Each for $224.00. 9607: with drain, Dimensions: 40" x 40" x 12" (1,016 mm x 1,016 mm x 305 mm),Weight: 51 lbs. (23 kg),Containment Capacity: 62 gallons (235 L),Uniformly Distributed Load: 800 lbs. (363 kg). each for $239.00. •Low 8 3/4" profile positions drum funnels below eye level - significantly reduces the potential for hazardous fluids to splash into the eyes or face. 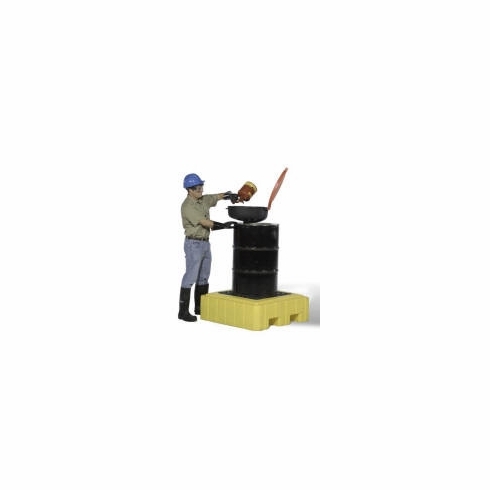 •Nearly 50% lower than standard spill pallets, drum handling is safer and less strenuous. •Large sump capacities meet EPA Container Storage Regulation 40 CFR 264.175 and Uniform Fire Code Spill Containment Regulations. •Removable grates feature a non-slip surface.